If you’ve been practicing yoga for a while chances are you’ve seen a yoga nidra class or workshop flyer hanging at your local studio. That’s because the ancient practice of yoga nidra, or ‘yogic sleep,’ has tons of benefits for both body and mind – And people are finally catching on! This deep state of conscious rest is no longer restricted to ashrams and advanced yoga teacher trainings – It’s quickly becoming a regular offering at studios across the country. So what’s all the hype about? If you’re new to yoga nidra, here’s everything you need to know about this enchanting practice. So what is it about this style that keeps yogis of all levels coming back for more? During yoga nidra, you get to lie in savasana the entire time while the instructor guides you through an in-depth, meditative series of relaxation exercises. Sounds pretty good, right? The practice outlines the koshas, or layers of our being, while thoroughly relaxing the body and awakening the unconscious and subconscious mind. You don’t need to be an expert on the koshas to reap the benefits of yoga nidra; you just need to be willing and open to receiving them. The benefits of this ancient practice are numerous and range from healthier sleep patterns to reduced stress and beyond. During this practice of psychic sleep, students enter a conscious state that flirts on the border of normal rest. This state of mind opens the possibility for profound transformation, healing, and self-growth using chosen intentions to permeate the subconscious. You might think of it as a very long savasana, except instead of silence, a teacher is directing your awareness throughout your body. Let your heart’s deepest desire surface to the forefront of your mind. Feel this deep, heartfelt desire radiate through your entire body while envisioning it in the present moment as if it were already true. Reflect on an intention for your practice – It could be to simply rest and relax. Maybe there’s a specific feeling or belief good like to investigate. Whatever your unique intention, greet it warmly with your entire body and mind. 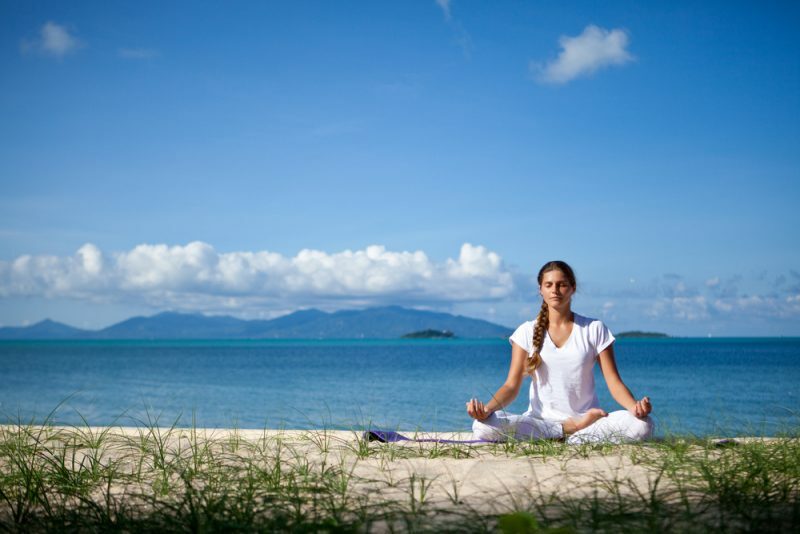 Next, bring your attention to the safe haven within your body where your feel a strong sense of security and calm. This could be a memory of a specific place, person, or experience that bestows a sense of ease. Acknowledge the availability of this sacred space at any point during your practice or in daily life. Shift your awareness to actively sensing and perceiving your physical body in the present moment by doing a full body scan. Follow the teacher’s voice as you observe different parts of the body and bring your full attention to each area. Begin by sensing your mouth, nose, eyes, and ears. Move to your forehead, scalp, jaw, neck, and inner throat. Scan your right arm and right palm, your left arm and left palm, and then both limbs simultaneously. Sense your abdomen, pelvis, and sacrum. Notice sensation in your left hip, leg, and foot, and then in your right hip, leg, and foot. Begin to count your breaths, elongating and observing them as they enter and exit the body. Feel your breath travel through the nostrils and throat into the rib cage and abdomen. Tune in to the sound, quality, and texture of your natural breathing rhythm. Bringing awareness to the breath allows us to notice where energy is stagnant and where it’s flowing freely. Invite the duality of different feelings and sensations into your practice without judging or trying to alter anything. We often experience emotions in this polarity – Yoga nidra teaches us to not depend on the positive end to feel safe, happy, comfortable, or fearless in our lives. Sense and embrace each emotion and its opposite within your body. As we explore opposition, observe and greet the beliefs, thoughts, memories, and images that presently exist in your mind without judgment. Use this unbiased information to deepen your understanding of your long-held belief systems and how they shape you as an individual. Evoke sincere memories of joy or bliss from your heart and allow that feeling to spread throughout your body and emanate to your surroundings. As you exhale, notice the warmth of these memories washing through you. Recalling these memories aids in resetting a mental baseline and soothing anxiety while bringing a present sense of peace. Stay aware of your ego as you dig deeper into the depths of your self. Continue to check your inner witness and notice this sense of identity when you make personal assertions regarding your current state. Experience yourself as an observer that is mindful of those feelings. Let thinking take a back seat and settle into awareness – Being fully conscious of the self. As your practice comes to an end, take a moment to reflect on where you’ve arrived and what path you took to get here. Acknowledge the power of the mind and reconnect to the feeling of pure awareness and stillness that’s always present within. Recall the intention and desire you set at the beginning of practice and unite them with your renewed sense of consciousness. The stages of yoga nidra allow students to connect with their deeper, spiritual self on a new level. It establishes the union of body, mind, and spirit while restoring their natural function. For those willing to receive this glorious sensation, a sense of oneness is awakened in the subconscious that allows students to feel no separation. This tranquil experience leads to an all-inclusive love for self and others, which become perceived to be the same thing. Yoga nidra has several compelling psychological benefits as well. It can support emotional healing and lessen symptoms of depression and anxiety. With consistent practice, students will feel a greater sense of joy and well-being. Those who suffer from hypertension, hypothyroidism, or insomnia can benefit significantly from the deep relaxation provided by a consistent yoga nidra practice. The sacred practice is known to reduce blood pressure, stimulate thyroid function, lessen tension, and improve sleep patterns. The combination of these benefits leads to a drastic reduction in both physical and mental stress. Insomnia contributes greatly to a variety of mental disorders, stress, and immune system suppression. Yoga nidra improves sleep and reduces the occurrence of insomnia by training the mind and body to relax and slip into a deeper state of sleep with ease. Not to mention, forty-five minutes of yoga nidra equates to 3 hours of sleep! Yoga nidra can be used to heal from past trauma effectively. Research has demonstrated the efficacy of the practice on soldiers with post-traumatic stress disorder. In fact, it was found to be so beneficial that yoga nidra became part of a weekly treatment program for soldiers across the country. Yoga nidra reduces symptoms associated with a variety of chronic pain and illnesses. This form of yogic sleep allows the body time to relax, recuperate and revive, which reduces inflammation and enhances the role of the immune system. It also provides relief from feelings of hopelessness and depression commonly linked to chronic pain. Heated power flows and advanced balancing postures aren’t suited for everyone. Yoga nidra, however, is a practice that everyone, from children to seniors, can enjoy comfortably. The cues are easy to follow and the body position is accessible to all ages. If lying flat on the floor isn’t possible, yoga nidra can be practiced from a seated position. We’re all familiar with ‘regular’ yoga poses such as downward facing dog, headstand, and forward fold; But what are the poses included in yoga nidra? After all, it is a yoga class! The answer to this question lies in the therapeutic essence of the practice. 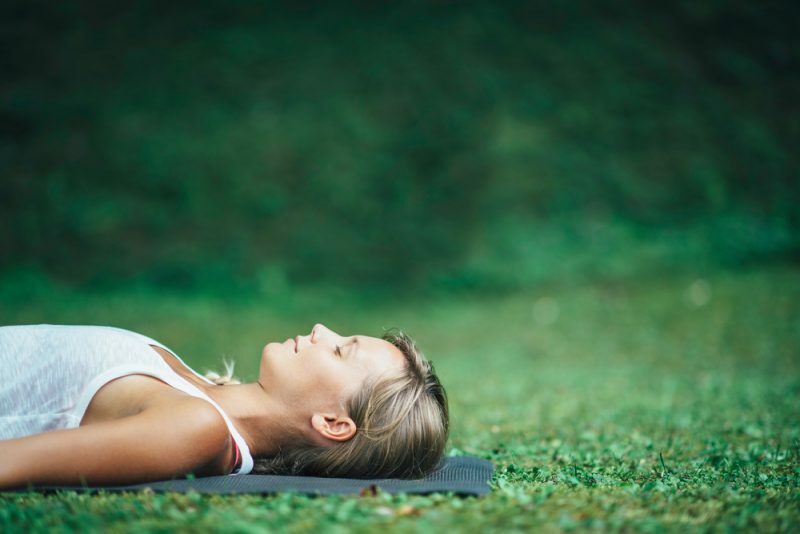 Savasana, or corpse pose, is usually the only posture utilized during yoga nidra and is held for the entire duration of a class. If this doesn’t sound like your cup of tea, fear not! Most classes come equipped with plenty of props to make the experience as comfortable as possible. Bolsters are great for under the knees to prevent lower back pain while blankets are useful for supporting the temperature drop that often occurs during deep relaxation. While traditional yoga classes feature a teacher calling out cues for different poses, yoga nidra instructors direct your awareness inward. The meditative imagery provided by instructors guides students into a hypnotic state that leaves them feeling rejuvenated and well-rested following the class. Yoga nidra is a particular kind of guided meditation where students enter a parasympathetic state. To reach this state, practices must be at least thirty minutes long with no distractions, whereas the time for meditation is unrestricted. Yoga nidra begins with a clear intention and heartfelt desire that creates the framework for the practice. The teacher then uses this framework to guide students through a series of inquiries related to their unique ‘sheaths’ of being. Don’t worry if this all sounds too good to be true – There’s plenty of science to back up all the benefits touted by yoga nidra. The typical chatter we experience on a day to day basis occurs in our usual beta brain wave state. Beta brain waves are where we spend most of our waking hours, and they indicate strong mental activity. As we begin to relax, we move from beta brain waves to alpha. This is where our brain goes after a job well done or a difficult task where we then take time to pause and reflect. This state is linked to reduced stress, lower blood pressure, and a decreased heart rate. For those who practice regularly, yoga nidra goes beyond this to the theta brain wave state or a state of deep relaxation. Daydreaming or ‘driving hypnosis’ both take place in the theta brain wave state. This is closest you can get to sleeping and the best way to connect to the subconscious. In this relaxed state, the left and right sides of the brain unite and find balance, which is what allows us to unwind and restore.